Guilford County’s growing immigrant community is one of the county’s most underserved populations for mental health services. The correlation between immigrant status and depression, anxiety, and substance abuse makes such services a critical need. Beginning this fall, one largely immigrant neighborhood will become the site of a new community-based mental health care provider through a project led by North Carolina Agricultural and Technical State University. The project will involve the departments of social work at N.C. A&T and the University of North Carolina at Greensboro, the Center for New North Carolinians (CNNC) at UNCG, and the joint A&T-UNCG master’s degree program in social work. Most of Oakwood Forest’s households are characterized as working poor with temporary jobs in construction, restaurants, and other service industries. In general across the nation, the Latino/Hispanic population is among those with the highest poverty rate and lowest rate of health insurance. North Carolina A&T and N.C. State University have been named as finalists for a national community engagement award thanks to a joint project of the universities’ Center for Environmental Farming Systems. The C. Peter Magrath University Community Engagement Award is presented annually by the Association of Public and Land-grant Universities. A&T and N.C. State were both nominated for “Building a Sustainable Local Food Economy in North Carolina through Partnership and Engagement.” The two universities and the N.C. Department of Agriculture and Consumer Sciences, through the Center for Environmental Farming Systems (CEFS), entered a brewing crisis between agricultural and environmental groups and found positive ways to tackle emerging environmental issues. The program led to the creation of NC Choices, which promotes the advancement of local, niche and pasture-based meat supply chains. The overall program is jointly headed by Dr. John O’Sullivan, farm management specialist with the N.C. A&T Cooperative Extension Service, and Nancy Creamer, professor of horticultural sciences at N.C. State University. CEFS was created in 1994 by A&T, N.C. State University, and the N.C. Department of Agriculture and Consumer Services at the Cherry Farm facility near Goldsboro. The center works with state and federal agencies, non-governmental organizations, farmers, and residents to provide agricultural research, extension, and education. As finalists, each institution will receive a cash prize of $6,000 as regional award winners and move on to compete for the national award during the National Outreach Scholarship Conference at the University of Alabama Sept. 30 through Oct 2. The national winner will be announced at the APLU Annual Meeting, Nov. 11-13, in Denver, Colorado. The center and SAS have put together a map of the state designed to be a single data source for education, business and demographic information. It ranks every county on 52 measures of population, education, imports and exports, and other criteria. It A detailed description is found here, courtesy of WRALtechwire. Guilford County, for example, ranks third in population and third in most demographic measures. It ranks first in K-12 enrollment in Chinese language classes, but only 14th in percentage of K-12 students enrolled in foreign language classes. Guilford is a net exporter by a considerable margin, $3.2 billion annually compared to $2.2 in imports. The map was developed by the center and SAS. It’s being shown for the first time today at the SAS corporate headquarters in Cary. Joint School building on the south campus of the Gateway University Research Park. Congratulations to the Joint School of Nanoscience and Nanoengineering — its brand-new building has been honored with the Star Award as 2012’s most outstanding new construction project in North Carolina. The award is presented annually by the Construction Professionals Network of North Carolina. The JSNN building won in the over $20 million category. 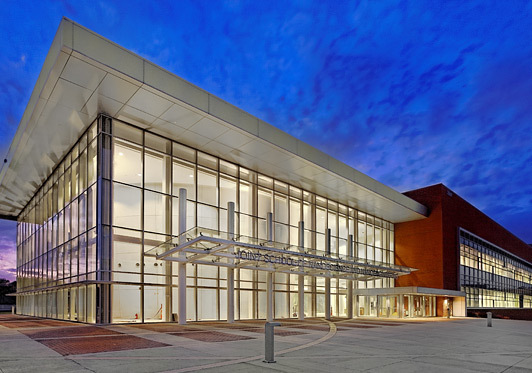 The other category, under $20 million, also was won by a Greensboro project, the International Civil Rights Center and Museum. Projects are selected on their merits and challenges. Criteria include the project’s outcome, overall project management, quality management, cost management, schedule management, project complexity, and innovation and creativity. The National Institutes of Health have selected Dr. Justin Zhan to participate in the Early Career Reviewer program of the Center for Scientific Review. Zhan is an associate professor of computer science at N.C. A&T. The center evaluates NIH research grant applications through peer review groups. The Early Career Reviewer program provides review experience to qualified scientists who haven’t previously had the opportunity to participate. This experience also benefits researchers in developing grant applications for their own research. The program was launched last year. Background on the program and information on how researchers can apply are available at the program’s website. Zhan’s research interests include information assurance and cyber security, social computing and social behavior modeling, and biomedical computing. He is the director of the iLab in the Department of Computer Science, which facilitates problem-driven interdisciplinary research on human-natural systems. He has previously been a faculty member at Carnegie Mellon University and the National Center for the Protection of Financial Infrastructure at South Dakota State University. He is editor-in-chief of two scholarly journals, the International Journal of Privacy, Security and Integrity, and the International Journal of Social Computing and Cyber-Physical Systems. The NIH peer review process is designed to ensure that grant applications are evaluated through a process that is fair, equitable, timely, and free of bias. A two-level peer review system is mandated by federal law. Initial reviews are conducted primarily by non-federal scientists with expertise in relevant scientific disciplines and current research. The second level of review is performed by the national advisory councils or boards of NIH institutes and centers. Two Guilford County high school teachers have been awarded Kenan Fellowships to spend 18 months working with researchers on an aviation project at N.C. A&T. Science teachers April King of the Middle College at N.C. A&T and Kathleen Melious of Andrews High School will be mentored by Dr. John Kizito on their project, “Designing Safe Aircraft.” He is a professor of mechanical engineering. The teachers will be immersed in the science, technology, engineering and math of the project and develop lesson plans around them. They “will follow the development of an aviation project from conceptual design through implementation, testing and reporting, and will create relevant lessons that motivate the next generation of rocket scientists in North Carolina,” the Kenan program says. The Kenan Fellows Program for Curriculum and Leadership Development is a competitive fellowship offered to K-12 public school teachers in North Carolina. Its mission is to enhance curriculum relevance for students; engage teachers, businesses, and universities through professional collaboration; and promote growth opportunities for teachers. It is a program of the Kenan Institute at North Carolina State University. The fellowships for Ms. King and Ms. Melious are sponsored by the National Aeronautics and Space Administration. A total of four teachers from Guilford County and 44 from around the state were selected for the 2013 program.